Global plastic straps market expected to reach USD 4.41 billion by 2024, growing at a CAGR of 18.8% between 2018 and 2024. Plastic straps are lightweight, flexible, and can be handled easily, which makes them suitable for bricks and tiles, paper, and cotton industries. The report of the plastic straps market provides a comprehensive glance at a global and regional level. The study provides historical data from 2015 to 2017 along with a forecast from 2018 to 2024 based on revenue and volume. 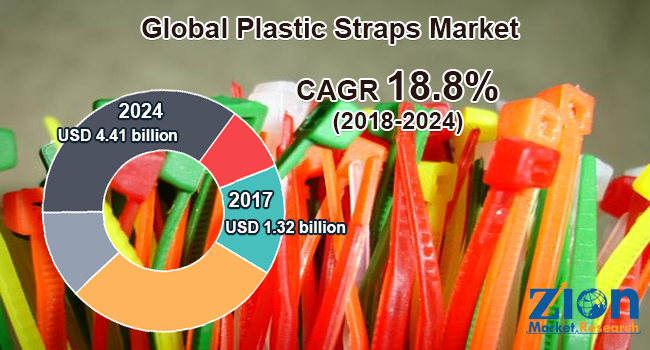 The study includes major driving forces and restraints for the plastic straps market along with the impact they have on the demand over the forecast period. Furthermore, the study also provides the major growth avenues for global plastic straps market. The global plastic straps market study also comprises a detailed value chain analysis for providing a comprehensive view of the market. Moreover, the study also includes Porter’s Five Forces model for plastic straps, to understand the competitive landscape of the global market. The study includes a market attractiveness analysis of all the segments related to the market. The study provides a significant view of the global plastic straps market by classifying it based on type, end-use industry, and region. These segments have been forecasted based on the future and past trends. By type, the plastic straps market is mainly divided into polypropylene straps, polyester straps, nylon straps, and others (composite straps, paper straps, and corded and woven straps). By end-use industry, the plastic straps market is mainly segmented into steel, paper, fiber, cotton, bricks and tiles, and others (print and corrugated boards). The regional segmentation includes North America, Europe, Asia Pacific, Latin America, and the Middle East and Africa. Furthermore, it is divided into major countries, such as the U.S., India, Germany, France, UK, China, Japan, and Brazil. Major vendors of the global plastic straps market include Crown Holdings, Polychem Corporation, Teufelberger, FROMM Packaging, Messersi Packaging, Dubose Strapping, Auto Strap, and PAC Strapping Products, Inc., among others.